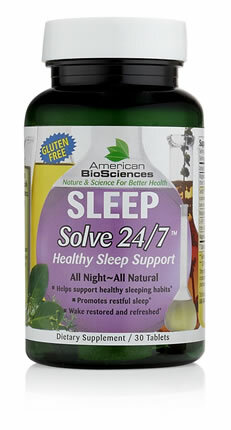 SLEEPSolve 24/7 Natural Sleep Supplements | Natural Sleep Aids For Adults | Supplements For Sleep - American BioSciences Inc. 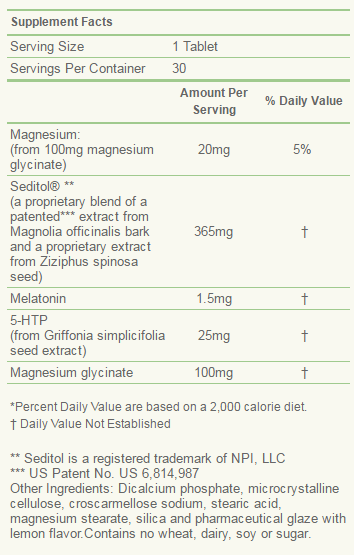 Active Ingredients: Seditol, Magnesium, Melatonin, 5-HTP. Here comes the sandman! Sleep experts say that almost all of the people they surveyed got a more restful sleep with this natural sleep supplement. Does this happen to you? You hop into bed—hoping to get a good night’s sleep—but when the lights go out, you stare into the darkness, your mind racing at 300 miles an hour? Do you ever lie there and stew about what you did today or what you didn’t do, and what you have to do tomorrow? If it’s not the mortgage, it’s a sick family member, a job you dislike, your neighbor’s incessant barking dog, or an endless litany of other things that stretch a mile long. If that describes you, welcome to the club of more than 60 million sleep-deprived Americans who go through the same maddening process every night, and if you ARE one of them, how would you like it to stop? Have a peaceful sleep every night! It’s so easy now to get a refreshing night’s sleep. In fact, by this time next week, you’ll be sawing logs and dreaming of flying unicorns [or whatever!] every single time you go to bed. More importantly, without relying on any medications whatsoever. How’s that sound? After extensive testing of the ingredients, a new, custom-designed, natural sleep supplement has just been released to the public. It’s a compound specially formulated to contain the four most powerful, natural, sleep-inducing, non-addictive ingredients ever combined in one tablet. It’s extraordinary! Wait ’til you try it, because when you want to sleep, you’ll sleep each and every time. When you want to wake up refreshed, you’ll wake up refreshed. And when you see others with foot-wide yawns and groggy-eyed looks on their faces, you’ll smile with a rested, stress-free, Cheshire-cat grin. Because you’ve SOLVED your sleep problem once and for all! How will you know SLEEPSolve 24/7 works? You’ll feel more relaxed, so falling asleep at bedtime will be easier and you’ll maintain a healthy sleep cycle. How long does it take for full effects? Some people feel the difference on the very first night while for others it may take up to 14 days. But almost everyone has a better night’s sleep with SLEEPSolve 24/7 and the best part is— it’s a non-addictive, natural sleep supplement. In one open human study, 93.9 percent said it supported a more restful sleep, and 96.8 percent reported being more relaxed. Nothing beats a refreshing, calming, stress-free sleep, especially the next day when you get twice as much done because you’ve slept so well the night before. Yes, nothing beats clearing your plate of that nagging to-do list quickly and with a refreshed attitude. Exclusive SLEEPSolve 24/7: four natural ingredients that will have you sleeping like a log! Got Questions About SLEEPSolve 24/7? Is it addictive? No. SLEEPSolve 24/7 can be taken nightly for an indefinite period of time. How long does it take to work? Many people feel the benefit the first night. Others need up to two weeks for full effect. Do I have to take a bunch of pills? Simply take one tablet, one hour before bed. For added benefit, you can take two tablets. How long will it help me sleep? Allow for seven to nine hours of sleep. Does it contain any medications? Absolutely none. Will I get to sleep fast? 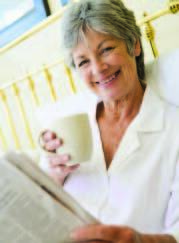 Almost immediately you will feel less stress, fewer nighttime worries, and more relaxed. How will I feel in the morning? 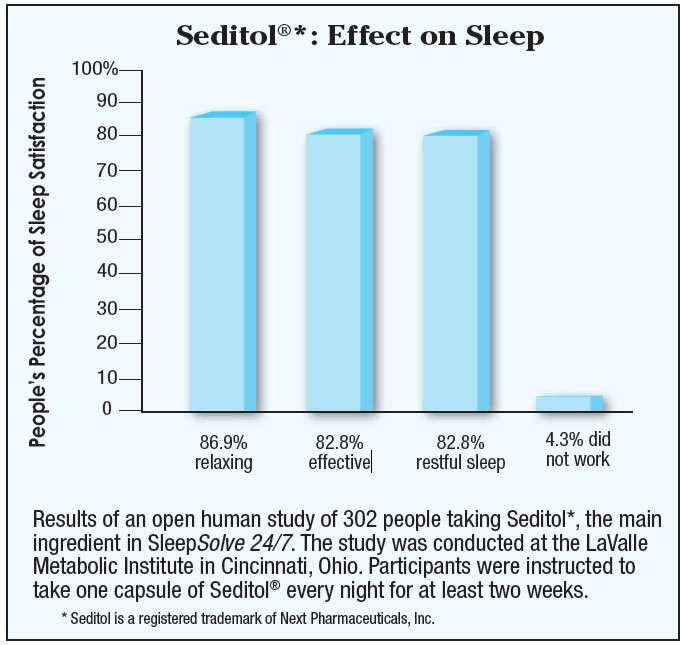 In an open-label human study of Seditol®, the main ingredient in SLEEPSolve 24/7, 93.9 percent reported a more restful sleep, 94.3 percent said it was effective, and 96.8 percent were more relaxed. Result—you’ll feel refreshed in the morning! Still have questions? Please give us a call! Sleep experts say that less than six hours of great sleep every night will age you prematurely, is bad for your immune system, increases risks of heart and brain disasters, and leads to around-the-middle weight gain. So relax, wind down, and don’t be a sleep-deprived victim any more. Try SLEEPSolve 24/7 NOW. One hour before bed, take 1 tablet ( for added benefit, 2 tablets). Allow for 7–9 hours of sleep. May take up to 7-10 days to achieve full benefit. Keep out of reach of children. Do not use if you are hypersensitive to any ingredients in this formula. Consult with a physician prior to use of this product if you are pregnant, nursing or have any existing medical condition. May cause drowsiness. Alcohol may intensify the effect.